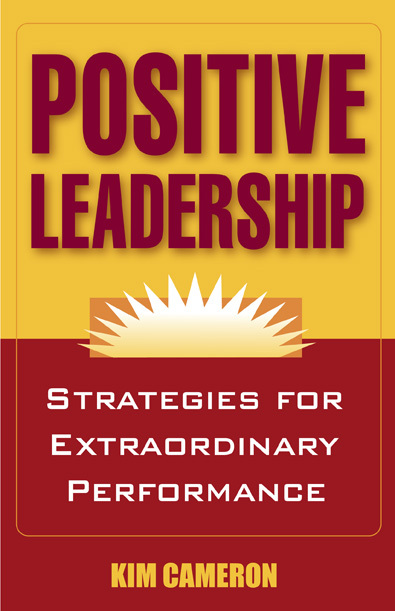 A five point review of Kim Cameron’s, Positive Leadership: Strategies for Extraordinary Performance. Kim Cameron, the father of 7 children and co-founder of the Center for Positive Organizational Scholarship, wrote the second edition of a concise book on positive leadership. I appreciated both the brevity and perspective of Kim’s book. He focuses on positive climate, relationships, communication, and meaning. This is not a saccharin perspective rather it is research based and brings out the power of positive in the workplace. Hundreds of studies and academic research findings are cited through out the book to offer evidence and support. If you want to have an impact on employee engagement, learning the practices of positive leadership will ensure you make great strides in increasing employee engagement in your organization. Key words associated with a positive organization are: vitality, flow, generous, excellent, extraordinary, perfect, benevolent, honoring, and flourishing. Positive emotions broaden and build so that experiencing positive emotions broadens people’s thought and actions while building their enduring personal resources. Build a positive climate through acts of compassion, collective forgiveness and gratitude so that people are cared for, supported, and flourish. Leaders create positive meaning by focusing on the value of an organization’s outcome beyond just personal benefit and they are attuned to the different orientations towards work: job, career, and calling. Ask yourself: What 2 or 3 actions can I take to enhance my effectiveness as a positive leader? Cameron offers a pithy book outlining the practices of positive leadership. I am positive you won’t be disappointed by this book. Are you positive about your ability to lead? David Zinger is a global employee engagement speaker and expert who in 2013 has worked on engagement in Delhi, Mumbai, Pune, Berlin, Prague and New York. His background is in Counseling and Educational Psychology and he has appreciated a positive orientation towards work going back to the early days of the Journal of Humanistic Psychology and the Journal of Transpersonal Psychology. To access Mr. Zinger’s services email him: david@davidzinger.com.